They may have Little as part of their brewery name, but it was with a rather large bang that Ryan and Fil launched Little Bang back in 2014. It was a 10 percent ABV bang that's returned for just the second time in cans for winter 2018. And it's name is Galactopus, the creature that adorns one wall at their Stepney brewery. The beer is a barleywine and first impressions will have you expecting the sort of high octane, malt forward beer that originated in England. 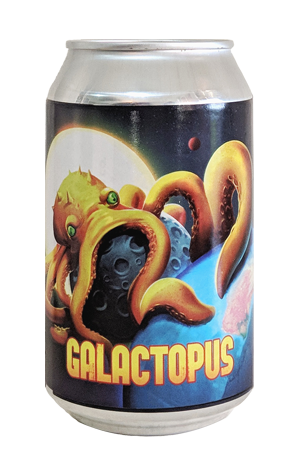 But it doesn't take long, once liquid meets palate, to disabuse you of that notion, as this Galactopus dips its tentacles into a Mariana Trench like gloop of hop acids before thwacking them across your unsuspecting palate. Sure, those intense sweeter characters are there, but this is a barleywine as American brewers intend, packing a mighty and aggressive bitterness that doesn't let its softer side settle for long.